The Hobby Lobby case is more clearly aimed at women, but Harris v. Quinn may prove even more consequential for the lives of working women. The War on Women found an ally at the Supreme Court last week with two rulings that threaten to deepen gender inequality in the workplace. The Burwell v. Hobby Lobby case is more clearly aimed at women, with its religiously inspired assault on women’s contraceptive healthcare access. But it was the ruling on union rights in Harris v. Quinn, which threatens a vital union for public healthcare workers, that may prove even more consequential for the lives of working women. Washington has for years been paralyzed by the right’s anti-abortion agenda and resistant to funding the most basic welfare supports for low-income mothers. Now the Court has expanded the attack on women through legal clampdowns on women’s economic and civil rights—attacking reproductive healthcare in one ruling and gutting women’s labor power in the other. Harris centered on Illinois home healthcare workers’ ability to collect dues from all workers they represent. Though the issues of “fair share” rules at unionized workplaces related to all public sector unions, Harris hit at the Achilles heel of public labor: the unique situation of home care workers for people with disabilities, working in private homes, but paid by the government. For this hybrid sector, the Court arbitrarily carved out of standard labor law a novel, and sexist, category, termed “partial public employees.” Siding with the national Right to Work Legal Defense Foundation, the decision effectively stripped unions working in the partial public sector of their ability to finance themselves by invalidating “fair share agreements,” the practice that allows unions to collect dues from employees of an organized shop. The target of the suit matters here. 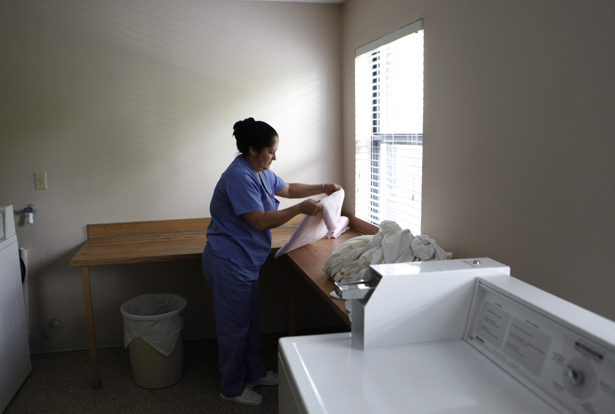 In home healthcare and other sectors of domestic work, the jobs have long been dismissed as “women’s work,” disproportionately done by poor women of color and immigrants. Besieged by the arduous schedules, psychological stress and physical strain of caretaking, homecare providers have the most to gain from unionization. They’re also some of the hardest workers to unionize, because the aides serve thousands of people with disabilities and their families, all in diverse households with unique medical needs. Some labor scholars noted that fair share is not yet completely abolished for all public workers, since the Court did not overturn the key precedent allowing public closed-shop unions, Abood v. Board of Education. And yes, the narrower decision in Harris may for now spare more conventional public sector unions, like direct employees of state agencies. Some actually see Harris as a potential springboard for intensified grassroots organizing strategies to “market” union membership to the rank-and-file. But Harris may nonetheless inflict major financial damage on an already precarious industry that remains largely atomized, unstable and unorganized. The evisceration of a rare bastion of unionism in domestic work could undermine efforts to organize the many other home attendants, housekeepers, nannies and other marginalized household laborers. Once dues evaporate, organizers may soon become stuck making an increasingly hard sell for an increasingly weak and underfinanced union. The ruling evokes the problems that hindered organizing back in the 1990s, when SEIU first started reaching out to home health aides in California. The high turnover and poverty wages made it a challenge to persuade workers to invest in any organizing project. But the union combined grassroots outreach with community education to enlist both local officials and consumers behind the union, and Illinois followed in 2003, turning homecare workers into official state employees and weaving together a strong union shop from thousands of individual providers in separate homes. Unionization paid off once the workers were hooked into the collective bargaining system. According to the Economic Policy Institute, wages jumped by 65 percent over a decade, workers gained health insurance coverage and job training, and recently negotiated to establish a formal grievance procedure. Home healthcare programs in California and Washington have seen similar gains in wages and benefits, which would otherwise be extremely rare in the in-home workforce. According to a CEPR analysis of the “union advantage” and gender inequality, union women are more likely to have decent family leave policies, retirement benefits and wages. Unionized female health aides generally earn wages that are 16 percent higher than that of their non-union counterparts. Meanwhile, though the union workforce is shrinking nationwide, women are becoming the majority and have especially high representation in public service jobs, thanks in large part to the immigration-driven growth in Asian American and Latina workers. And that brings us back to why Illinois home attendants were a perfect target for the anti-union movement. Union-supported homecare demonstrates how women, “big government” and consumers can effectively work together, so naturally, the right is fighting to destroy this model before it catches on in more states. Hobby Lobby revealed how companies can lord over working women’s reproductive freedom in a deeply inequitable insurance system. Harris struck from another angle—eroding union women’s labor power and threatening public health services in the process. Unions are a tool for resistance; although unionization alone won’t overcome greed or religious chauvinism in corporations, a strong collective bargaining system would give women a platform to hold bosses accountable and thwart reactionary attacks on health programs for workers and the poor. The Supreme Court has highlighted the right’s hostility to both labor and public health protections. But when women in public service defend their labor rights, they safeguard the welfare of those who receive care as well as those who give it. Michelle ChenTwitterMichelle Chen is a contributing writer for The Nation.